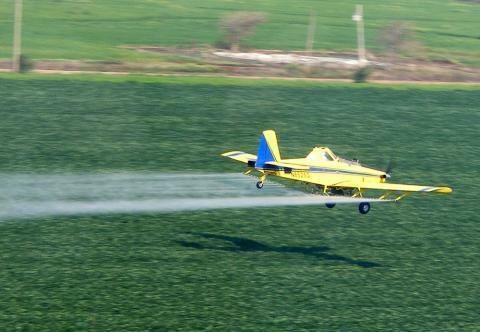 A pilot for Earl's Flying Service sprays chemicals on a field in southeastern Missouri. 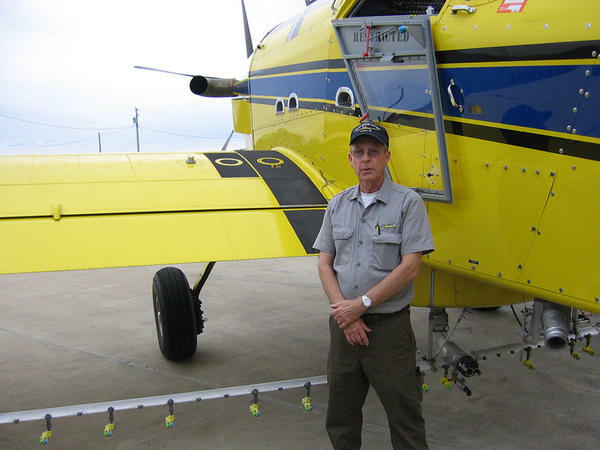 Missouri pilot Mike Lee stands next to a crop-duster. "I know some people who have had accidents. I've had friends that got killed in these things," he says. Crop-dusting pilots are the adrenaline junkies of the agriculture world. They whiz through the air, flying under power lines to sow seeds or spread pesticides on farmers' fields. It's a dangerous job, and now these pilots are facing a new challenge — short towers that can sprout up in fields overnight. These towers are used to gather data for wind energy companies. Pilot Mike Lee started Earl's Flying Service in Steele, Mo., in the early 1970s and has been flying ever since. "I know some people who have had accidents. I've had friends that got killed in these things," he says. When he's crop-dusting, Lee flies at 155 mph at the crazy-low elevation of 12 feet. Farmers hire him because it's a quick, efficient way to get things done. There's no driving out to remote fields or slogging equipment through the mud. It's all done by air from the cockpit. Crop-dusters are the ultimate multitaskers. They fly while dodging obstacles like trees and power lines. They don't want to pour pesticides on a farmhouse by mistake or sprinkle the wrong seeds on a neighbor's field. Pilots are stumbling across a new hazard now: unmarked towers that are used to prospect for wind energy projects. "You have to be able to just ... fly by the seat of your pants and not even think about flying to do all of that. You gotta spend all your concentration looking outside and doing all the controlling the seed or fertilizer or chemical or whatever it may be at the time," Lee says. That's part of what makes this job so dangerous. Pilots' attention is divided, and they work long hours. During the growing season, they fly sunrise to sunset. "Radio towers seem to be the No. 1 problems. You know, these little weather MET towers they stick up overnight and nobody knows about. It's been a major problem in our industry," Lee says. Those METs — or meteorological evaluation towers — are thin and metal; they kind of blend in from the air. Farmers lease some of their land to wind energy companies that use them to gather data. National Transportation Safety Board investigator Jennifer Rodi says these towers are very hard to see. "They are below the 200-foot requirement that the FAA has that requires them to be lit and marked to increase their visibility," she says. In a report earlier this year, Rodi and the NTSB made recommendations to the FAA to mark and light those towers and to create a database with the location of each one. Tom Vinson of the American Wind Energy Association says the wind industry supports marking towers with orange-and-white paint, and putting up orange balls on guy wires. But lighting is trickier because towers are often in remote locations without a power source. And wind farm development is a very competitive process. That's why the database with each tower's location is a thornier recommendation. "People are very hesitant to let competitors know where they may be looking, and so there has been some concern about having widely available public databases," Vinson says. Since 2000, three pilots have died after striking unmarked METs. Just this September, the family of a California pilot was awarded a $6.7 million wrongful death settlement after his crash into an unmarked MET. When you look at the big picture, crop-dusting has become safer. Accidents are down, and fewer crashes are fatal. Pilots have better training, and Mike Lee says the airplanes now are designed for safety. Pointing to one of his planes, he says it was made to absorb energy in a crash. "Kind of a like a NASCAR, it's going to disintegrate around you, and most likely you'll still be holding the stick and in the seat when it's all said and done," he says. That may be reassuring for some crop-dusters, but from the pilot's perspective, knowing the exact spot of every potential hazard works even better. Copyright 2017 KRCU. To see more, visit KRCU. 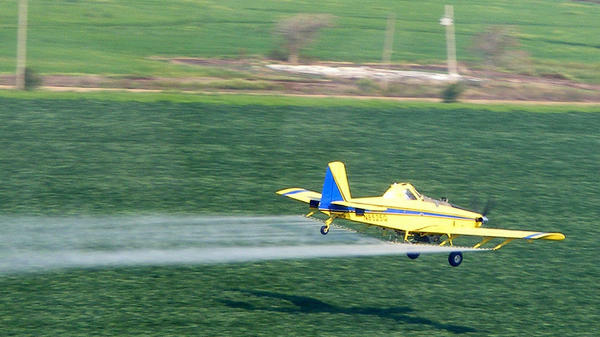 Crop-dusting pilots are the adrenaline junkies of the agriculture world. They fly fast. They fly low. They often dive under power lines while sowing seeds and spreading pesticides. This dangerous job has become even more dangerous. Jacob McCleland of member station KRCU reports. JACOB MCCLELAND, BYLINE: If you're going to do a story about crop-dusting, you might as well start in the sky. I'm flying with Mike Lee directly above the Missouri-Arkansas state line. Below, it's a never-ending checkerboard of green and brown of fields of rice, cotton, corn and soybeans, with a little milo and popcorn for good measure. MIKE LEE: I know some people who've had accidents. I've had friends who've got killed in these things, you know. MCCLELAND: Mike Lee started Earl's Flying Service in Steele, Missouri in the early '70s. He's been flying ever since. When he's crop-dusting, he flies at 155 miles an hour at the crazy low elevation of 12 feet. Farmers hire him because it's a quick, efficient way to get things done. There's no driving out to remote field or slogging equipment through the mud. It's all done by air from the cockpit. LEE: These are your basic controls right here. This right here just makes it - pull back to go up and down to go forward and right and left - you know? - very simple. MCCLELAND: Crop-dusters are the ultimate multitaskers. They fly while dodging objects like trees and power lines. Pilots are stumbling across a new hazard now, unmarked towers that are used to prospect for wind energy projects. LEE: You have to just be able to fly - just by the seat of your pants and not even think about flying to do all of that, you know? You've got to spend all your concentration looking outside and doing all the - controlling the seed or fertilizer or chemical, whatever it may be at the time. MCCLELAND: And that's part of what makes this job so dangerous. Pilots' attention is divided, and they work long hours. During the growing season, they fly sunrise to sunset. LEE: Radio towers seems to be the number one problem, these little weather MET towers they stick up overnight. And nobody knows about it. It's been a major problem in our industry. MCCLELAND: Those MET towers, or meteorological towers, are thin and metal. They kind of blend in from the air. Farmers lease some of their land to wind energy companies that use them to gather data. JENNIFER RODI: They are very hard to see. MCCLELAND: That's National Transportation Safety Board investigator Jennifer Rodi. RODI: They are below the 200-foot requirement that the FAA has that requires them to be lit and marked to increase their visibility. MCCLELAND: In a report earlier this year, Rodi and the NTSB made recommendations to the FAA to mark and light those towers and to create a database with the location of each one. Tom Vinson of the American Wind Energy Association says the wind industry supports marking towers with orange and white paint and putting up orange balls on guy wires. But lighting is trickier because towers are often in remote locations without a power source. And wind farm development is a very competitive process. That's why the database with each tower's location is a thornier recommendation. TOM VINSON: People are very hesitant to let competitors know where they may be looking. And so there has been some concern about having sort of widely available public databases. MCCLELAND: Since 2000, three pilots have died after striking unmarked MET towers. Just this September, the family of a California pilot was awarded a $6.7 million wrongful death settlement following his crash into an unmarked MET. When you look at the big picture, crop-dusting has become safer. Accidents are down, and fewer crashes are fatal. Pilots have better training. And as Mike Lee, the Ag pilot in Missouri, says, airplanes now are designed for safety. Pointing to one of his planes, he says it was made to absorb energy in a crash. LEE: Kind of a like a NASCAR, it's going to disintegrate around you. Most likely, you'll be sitting there holding the stick and in the seat, you know, when it's all said and done, you know? MCCLELAND: That may be reassuring for some crop-dusters, but from the pilot's perspective, knowing the exact spot of every potential hazard works even better. For NPR News, I'm Jacob McCleland in Cape Girardeau, Missouri. Transcript provided by NPR, Copyright NPR. Mike Lee steers his plane over the Missouri-Arkansas state line, checking out a checkerboard of green and brown fields of rice, cotton, corn and soybeans. Lee is the owner of Earl’s Flying Service, a crop dusting business in Steele, Mo., and he’s scouting some farm fields that his pilots will treat later in the day.